LINE-UP ALMOST COMPLETE! Limited amount of day-passes now available! 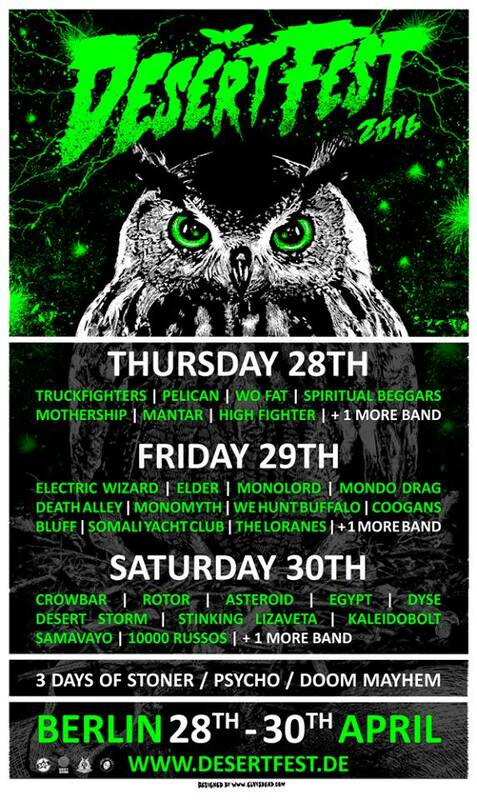 Desertfest Berlin, which takes place between April 28th - April 30th 2016, has announced a first running order of their almost complete and stunning line-up, there will be 3 more bands announced soon. The 3-day passes are sold out, but the limited day-tickets are now available onwww.desertfest.de/tickets! this year's Desertfest Berlin 2016 will be the 5th edition and offers THE ultimate heavyrock-psycho-doom festival! 3 days of rock mayhem with 30+ performing acts on two stages, visual arts and hippie market. The full package nested in the beating cultural heart of Berlin at the famous ASTRA KULTURHAUS.